This is a rich, sweet, and aromatic cappuccino with a creamy vanilla flavor blended to perfection with Deep Rich® dark roast coffee. This is a very popular flavor and one that is enjoyed by many! Each 2 lb. bag of French Vanilla Cappuccino Mix makes about 22 - 8 oz. servings. INGREDIENTS: SUGAR, NON DAIRY CREAMER (CORN SYRUP SOLIDS, PALM OIL, MONO-AND DIGLYCERIDES, DIPOTASSIUM PHOSPHATE, SODIUM CASEINATE (A MILK DERIVATIVE), CONTAINS LESS THAN 2% OF SILICON DIOXIDE, ARTIFICIAL COLORS, SODIUM STEROYL LACTYLATE, NATURAL AND ARTIFICIAL FLAVORS. 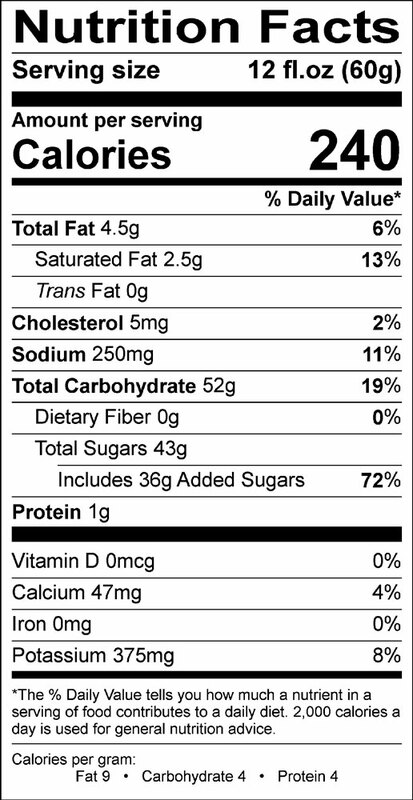 ), WHEY, CONTAINS LESS THAN 2% OF ARTIFICIAL COLOR, CELLULOSE GUM, CREAMER (CREAM, NONFAT MILK, DIPOTASSIUM PHOSPHATE, AND SILICON DIOXIDE), INSTANT COFFEE, NATURAL AND ARTIFICIAL FLAVOR, SALT, SILICON DIOXIDE, XANTHAN GUM. We have a small coffee bar at our RV park and our customers love your products, French vanilla and the hot chocolate. Very good and delivered very timely. I love the French vanilla cappuccino. The taste is purely great. This is the best tasting cappuccino I’ve found. It’s a great portion size at an unbeatable price. No comparison! I love the French vanilla cappuccino. I drink it every morning. I enjoy a cup of cappuccino 2;30 to 3:00 in the afternoon as a very pleasurable pick me up. Also, I enjoy adding the cappuccino to a cup of reheated coffee as my afternoon "be nice to myself". This is the best cappuccino I have found., both the French Vanilla and also the English Toffee, the Raspberry not so much.